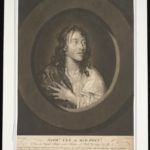 Folger Theatre’s upcoming production of Macbeth, adapted by Sir William Davenant from Shakespeare’s play, frames the tale of ambition and bloody deeds within the walls of 17th-century Bedlam. 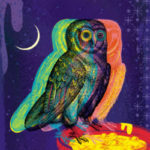 In this venue, an imagined performance by inmates of the London institution fuses the rich Restoration music and spectacle of Davenant’s adaptation with historical elements. Dramaturgical intern Sarah Lind takes us on a tour of Bedlam’s history in anticipation of Macbeth’s first preview on September 4th. 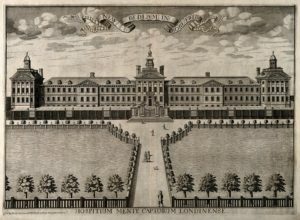 Engraving of Hospital of Bethlem at Moorfields by A. Soly. 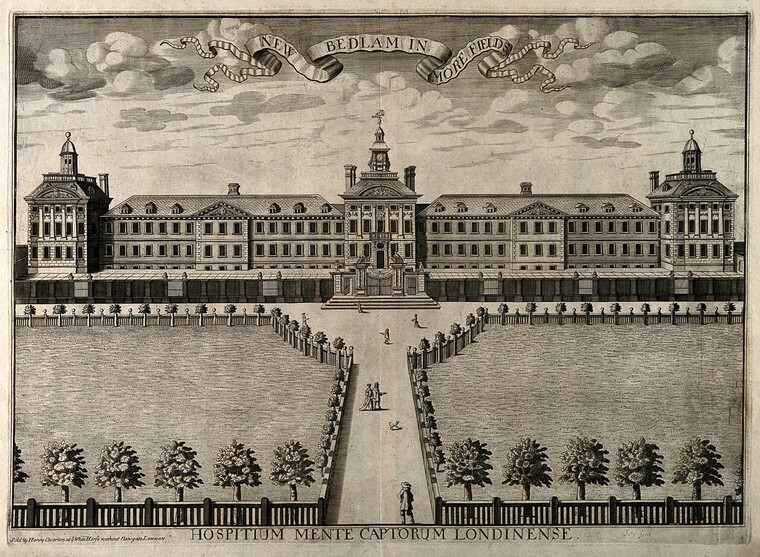 This is the second building of Bethlem Hospital [Bedlam], built in 1675-1676 in Moorfields, London, designed by the architect Robert Hooke. Source: Wellcome Collection. Established in 1247, Bethlem Royal Hospital admitted its first recorded patients with mental illnesses in the 15th century. By Shakespeare’s time, Bedlam, as the asylum was nicknamed, primarily housed poor people with mental illnesses, supporting them through public charity, while their upperclass counterparts received private funding. To the public, however, Bedlam was not just a place to stow away society’s insane: it was, in fact, a tourist attraction where a paying visitor could see the “mad folk” of society, offering spectacle and curiosity as well as cautionary and moral lessons. European swing chair therapy, late 18th-century. Wellcome Collection. Surgical instrument set (including bloodletting knife) with case, England, 1650-1700. Wellcome Collection. William Norris restrained by chains at the neck and ankles in Bethlem hospital, London. Coloured etching by G. Arnald, 1815, after himself, 1814. Wellcome Collection. “The douche, a method for calming violent lunatics.” Shows cold water bathing as treatment for the insane. Wellcome Collection. 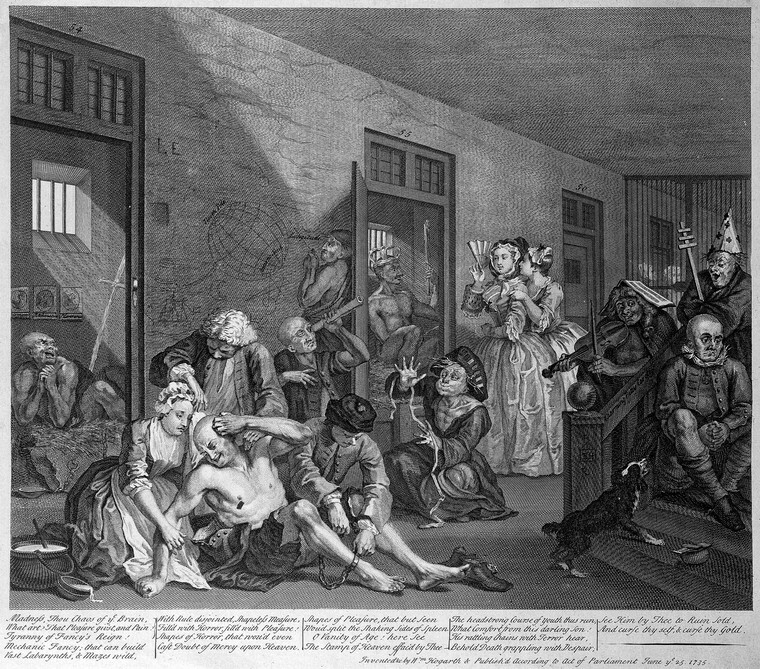 William Hogarth’s A Rake’s Progress (1735), Plate 8, depicts two upper class visitors viewing asylum inmates. 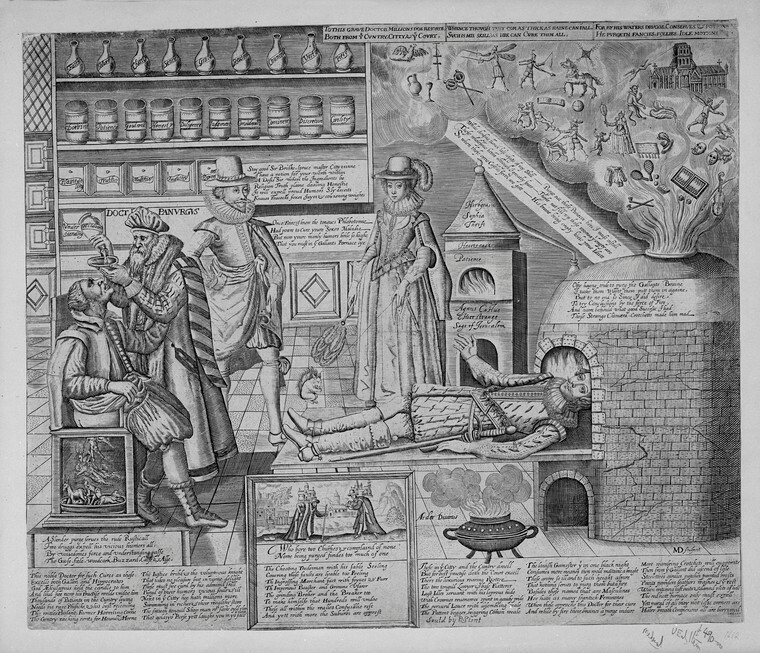 At the center of the engraving is Tom Rakewell who gambles away his fortune, eventually descending to destitution and madness. Wellcome Collection. 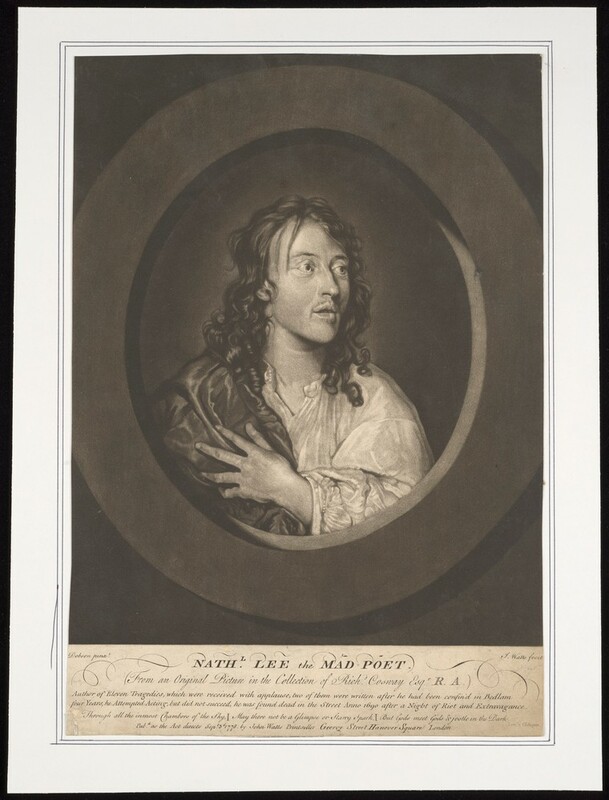 A playwright with a considerable reputation, Nathaniel Lee, the “Mad Poet,” spent five years in Bedlam. Wellcome Collection. Visitors might also be interested in seeing famous Bedlamites such as Mary “Moll Cutpurse” Frith, Daniel, Oliver Cromwell’s clairvoyant porter, and the politico-religious dissenter Richard Stafford. These inmates had track records of questionable societal behavior such as publishing disruptive prophetic or religious tracts, attempted regicide, loose sexuality, and political offenses, all of which may have contributed to mental breakdowns or, simply, admittance into Bedlam. Madness is represented as fantasies or folly that must be purged from the brain with chemical and medicinal cures. Line engraving by Martin Droeshout, ca. 1620. Wellcome Collection. But Bedlamites on display were also objects of charity, not just monstrosity or intrigue. As the leaders of the asylum hoped, seeing society’s most vulnerable might invoke feelings of pity and compassion for paying visitors. Money given by visitors for admission was expressly used for the benefit of the inmates and inscriptions on poor boxes installed at the entrances of asylums encouraged a paying public to “Remember the poore Lunaticks.” Until major institutional reforms began in the late 18th century, Bedlam’s “theatre of madness” continued to entertain visitors with sights of society’s most strange. The figures of “Raving Melancholy and Madness” crowning the gates of Bethlem Hospital, perhaps points to the public display of the inmates. Engraving by C. Grignion after S. Wale after C. Cibber, 1680. Source: Wellcome Collection. Today, Bethlem Royal Hospital still stands as a modern psychiatric care facility. Its long legacy is recorded in archives, histories, and museums, yet Bedlam lives on in popular imagination as a choice setting for horror films and mystery novels—and the Folger’s current Macbeth. How did Bedlam’s history inspire our production? Tune in later in the run to find out more! Hattori, Natsu. “‘The pleasure of your Bedlam’: the theatre of madness in the Renaissance.” History of Psychiatry, vol. vi, 1995, 283-308. Andrews, Jonathan, Asa Briggs, et al. The History of Bethlem. Routledge: London. 1997. Print. Thanks to Sarah for sharing her insights! Stay tuned for her second post on Bedlam in this production and more peeks at Folger Theatre’s Macbeth, which begins performances on Tuesday, September 4. For tickets and more information, visit us online or call the Folger Box Office at 202.544.7077.